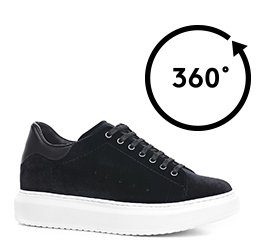 Low-top sneaker with 2.6 inches (6.5 cm) inner elevator system featuring upper in black soft velvet enriched by the tone-on-tone detail in full-grain leather on the heel tab. The white sole is in natural rubber. A casual shoe entirely handcrafted, designed to become a true style must-have among the coolest sneakers of all time.